HESCH HISTORY: Comparing 1880, 1890 and 1900 in Morrison Co. Comparing 1880, 1890 and 1900 in Morrison Co. These statistics interest me especially regarding the countries our folks came from, of course. We know our Sands came from Luxembourg, as did the Neisius family, the Zenners, the Brixius and Majerus families among many others, but the census in 1900 says there was only one immigrant from there. By then, people just said "Germany"--it was easier. Otrembas, Rauschs, Schmolkes and many others came from "German Poland", "Austrian Poland" or "Russian Poland", while over 1,100 claimed Germany. 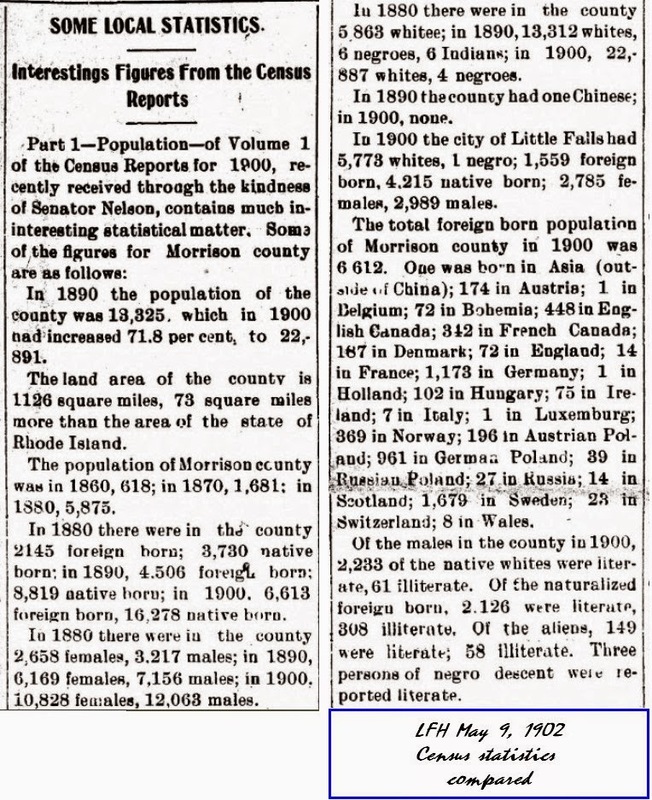 It's fascinating, too, how quickly Europeans in Morrison Co increased, from 618 in 1860 to 22,891 in 1900.